Professional Baseball in Covington: They built it but they did not come. Remember the film Field of Dreams? Kevin Costner’s character builds a baseball field in the middle of his corn field because a voice told him to do it. In 1913 here in Covington, KY baseball enthusiasts and businessmen wanted to bring a professional baseball team to the city. Baseball was viewed as a great way to advertise the city. Those working to bring a club here believed the city would be placed on the map after they landed a team. Can you imagine having two different teams to root for like they have in Chicago and New York, it almost happened but it did not last long. At the end of the 1912 season the Blue Grass League lost two teams. The Blue Grass League was a Class D Minor League which had teams in cities throughout Kentucky. In order to fill the two vacant spots the organization set its sights on the river towns of Covington and Newport in Northern Kentucky. The attempt to establish teams in Newport and Covington by the Blue Grass league was blocked by the Cincinnati Reds. As a member of a major league (the National League) the Reds had jurisdiction covering a five mile radius that forced smaller leagues like the Blue Grass League to seek permission from establishing clubs in their surrounding area. Newport and Covington both fell under this five mile radius and Garry Herrman of the Reds refused to let the teams establish on the Kentucky side of the Ohio River. Covington almost missed out on bringing a professional baseball club to the city, but the Federal League was forming in Indianapolis and was looking to establish a team in Cincinnati or Covington. The Reds had no jurisdiction of this league as it was not a member of organized baseball and considered an outlaw league. After some hoopla over where the team would play Covington was awarded the franchise and immediately set out to build a ball park. The club was named the Covington Blue Sox to memorialize a team that had once played in the city thirty years prior in the late 1870s. Club organizers after incorporating under the Covington Amusement Company selected a small lot at 2nd and Scott Streets to build a ballpark due to its close proximity to the suspension bridge. Opening Day in Covington was scheduled for May 9th 1913. Construction on the park continued ‘round the clock to complete the new park by the home opener. Work on Federal Park began on April 16th 1913. Crews had only a few weeks to build the park in time for Opening Day on May 9th 1913. The park by all comparisons was tiny with the distance from home plate to right field being 197 feet, and 267 to center field and 218 to left field. Club owners promised a good brand of baseball despite the size of the park. With the park under construction club owners set out to build their team. The club had several managerial candidates including the Detroit Tiger great Ty Cobb. Cobb was in the middle of a contract negotiation and the Covington club promoters tried to bring him here to manage. Cobb did not accept the offer. With Cobb out of the picture the club hired Sam Leever and he quickly went to work putting a team together of players from all parts of the country. 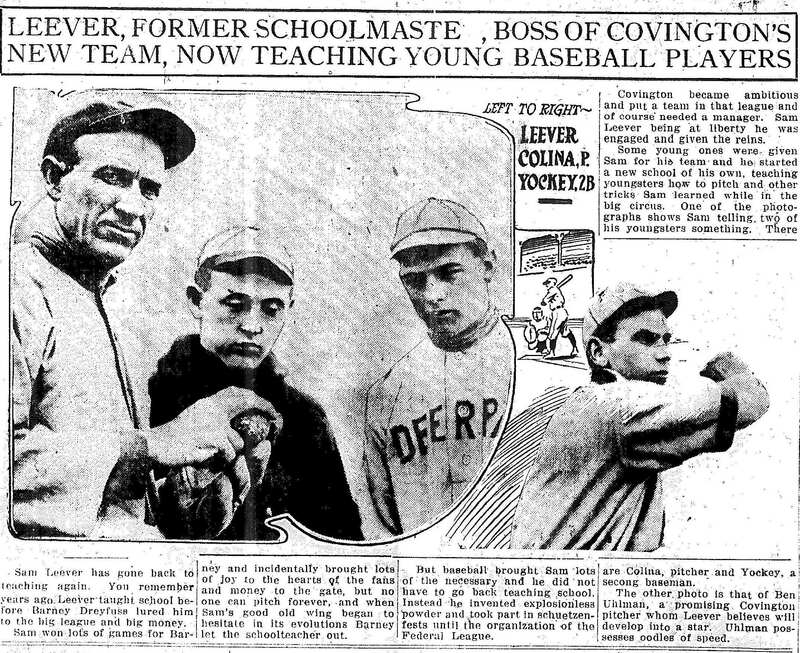 Nicknamed the “Schoolmaster” from Goshen, Ohio, former Pittsburgh Pirate Sam Leever was tapped to lead the Blue Sox to the inaugural Federal League Pennant. They held tryouts and practices at Crowe’s Park in Hyde Park while the home park was being built. The team played a few exhibition games against a team of assembled professionals, the West Baden, Indiana Sprudels and a team from Kokomo, Indiana. 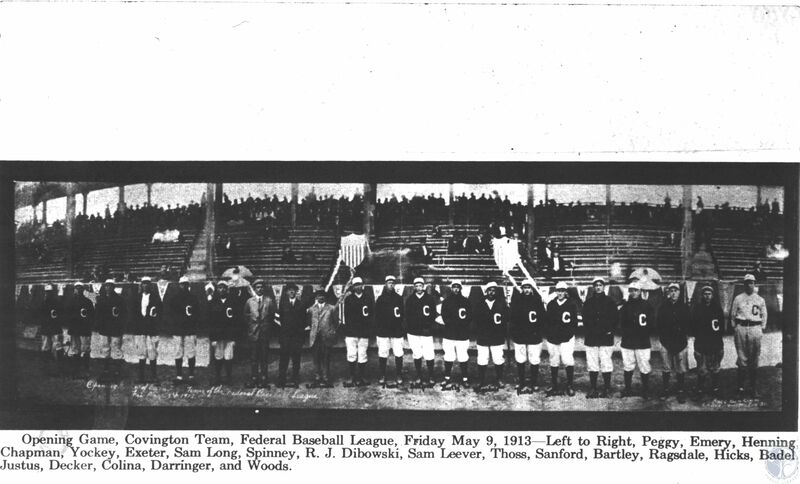 The Blue Sox played in the inaugural Federal League game at Cleveland. The two teams battled through a ten inning 6 to 6 tie. The umpire called the game due to darkness. The Blue Sox held their Opening Day on May 9th 1913. Covington Mayor George “Pat” Phillips had declared a half holiday for the city with city offices closing at noon and encouraging businesses to close to support the team. It was a festive day with a parade, bands and decorations across the city. One can only imagine and wonder how it would have stacked up against a modern Reds Opening Day Parade. The dedication ceremonies on the field were just as vibrant as the parade, with the mayor tossing out a golden ball for the ceremonial first pitch, messenger pigeons being released to spread the news of the opening to each city on the Federal League circuit as well as one going to President Woodrow Wilson. Part of the ceremonies for Opening Day, Covington Mayor George “Pat” Phillips throws out the ceremonial first pitch. 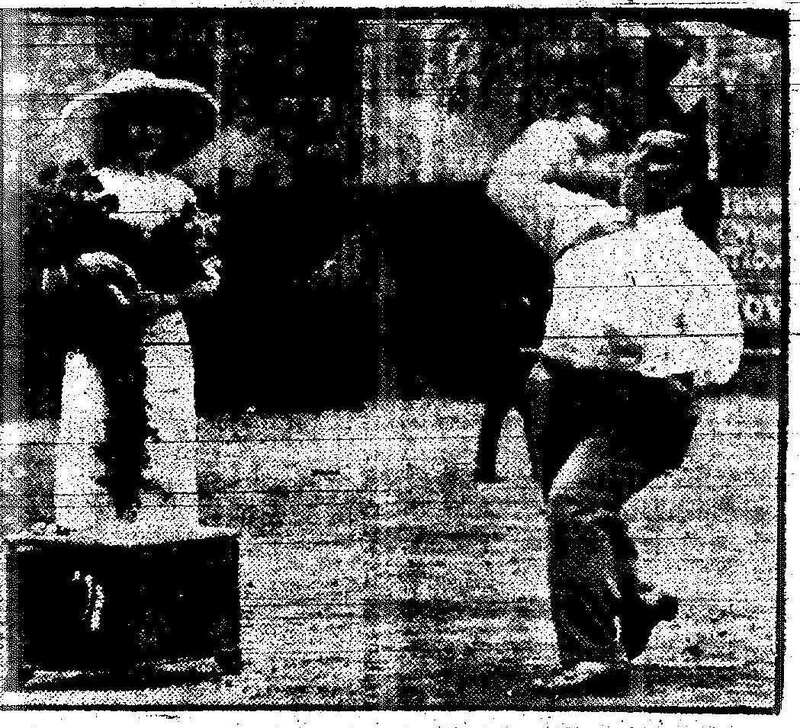 Standing next to him Alice Coleman, holding a bouquet of American Beauty roses waits to release a number of messenger pigeons to announce the opening of Federal Park in Covington to the cities on the Federal League circuit and President Woodrow Wilson. A photograph of the entire team from Opening Day May 9 1913. It may very well be the only photograph of the team. In front of a crowd of over 6,000 the Blue Sox shut out the visiting St. Louis team 4-0. It seemed as if the new club was a hit and would be long lasting. The club would go on to play some decent baseball. Blue Sox second baseman James Emery even smacked an inside the park home run during a game in May. Despite a stint as league leaders the support for the club never reached the large crowds that Opening Day had brought. The team experienced several rain outs and a lengthy road trip during the month of June that did little to keep the team on the minds of the locals. Rumors began swirling that the club was in trouble and may be forfeited, but were denied adamantly by club officials. Ads like this appeared almost daily in the local newspapers. Take note of the announcement of Ladies Day Friday, the club tried numerous promotions such as this to generate support. The June 19-22 home series against St. Louis would prove to be the final home stand of the Blue Sox. On June 25th several local newspapers announced the franchise had been forfeited. The Federal League chose Kansas City to be the new home of the club. Covington club officials cited poor attendance to be the primary culprit behind the ventures failure. By 1914 the Federal League had become a third major league and rivaled the American and National League’s. Many players from the National and American League joined clubs in the Federal League. The Federal League became a Major League from 1914 and 1915. before it disbanded at the end of the 1915 season. If you have any more information about this team that you would like share, including photographs and memorabilia please contact Luke Groeschen at Luke.Groeschen@kentonlibrary.org.